Pinnacle Crystal SiO2 Spray combines a blend of natural ingredients and advanced SiO2 technology to provide your vehicle with long-lasting protection and high levels of hydrophobicity. The hydrophobicity ensures that water cannot rest on the surface of your vehicle. When water collects on the surface it evaporates and deposits minerals on your paint which causes water spots and etching. SiO2 makes water bead up on the surface of the paint and roll off harmlessly. 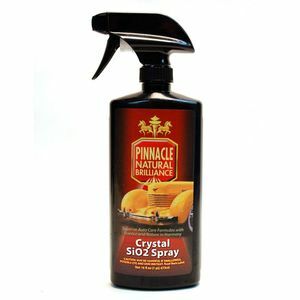 Pinnacle Crystal SiO2 Spray is highly effective as a standalone product, offering months of protection. It can also be used to extend the life of and increase the hydrophobicity of your current wax, sealant, or silica coating. In addition to its protective qualities, this SiO2 spray also delivers superb shine to your paintwork. 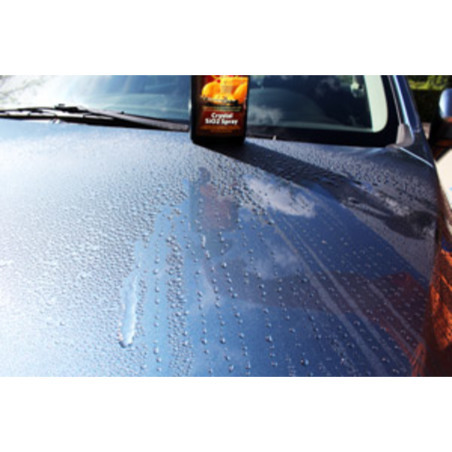 The spray ensures it’s much quicker to apply than traditional waxes and sealants. For best results, wash and dry surface to be treated before application. Shake well. Spray product onto a clean and dry microfibre towel or directly onto paint, being cautious of overspray. Using an even motion, apply to the surface. Allow to haze and use a second, clean microfibre towel to buff off.